This is the fifth entry of Russia’s Alien Nations: The Secret Identities of Post-Socialism, an ongoing feature on All the Russias. It can also be found at russiasaliennations.org. You can also find all the previous entries here. 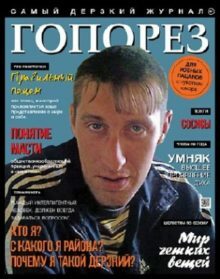 Chapters One (Soviet Self-Hatred: The Rise and Fall of the Sovok) and Two (Whatever Happened to the New Russians?) deal with what I call Soviet self-hatred, specifically the late-Soviet phenomenon known as sovok. When referring to a person rather than to the whole country, sovok projected Soviet insecurities about culture and sophistication onto a particular kind of yokel who was the source of embarrassment, humor, and even, occasionally, pride. As the USRR faded into history, the sovok was succeeded by a figure who would seem to be his opposite: the New Russian. Where the sovok was poor, the New Russian was rich. Where the sovok had difficulty navigating the world of much-desired consumer goods, the New Russian reveled in it (but still managed to get things wrong). Where the sovok was obsessed with his own particular notion of “culture,” the New Russian wouldn’t know culture if it hit him in the face with a thousand-dollar handbag. What they have in common is their capacity to shame, by embodying the embarrassing yokel whom more sophisticated Russians would prefer either to forget, or, if necessary, keep alive as a cathartic figure of ridicule. More recently, similar anxieties manifest themselves in the elites’ disdain for the common “herd” (bydlo) and liberals’ disgust with the Crimea-obsessed, pro-Putin nationalist vatniki (named for the cheap, puffy coats they are said to wear). Both the bydlo and the vatniki continue the process of alienation that had already accelerated with the figure of the new Russian, for the speaking subject who uses these words is denying all kinship with their targets (though vatnik has the complication of being an ethnic slur when deployed by Ukrainians). These chapters will have a more historical (and even philological) scope than the others, since I trace the development of the term “sovok” back to the 1980s, its rise in the discourse in the late 1980s and 1990s, its manifestations in film and mass culture, and the near disappearance of the term in the past ten years as a reference to people (but not as a reference to the Soviet Union or Soviet system, which was always one of the word’s two primary meanings). I also will chart a similar history of the term “new Russian,” and discuss the conditions that have made this term less relevant than it was at the turn of the century. There will also be a brief detour into the world of the gopniki.